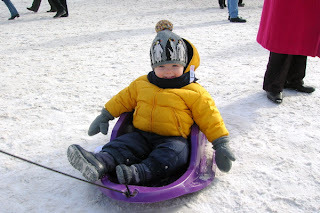 After much talk and hand-wringing in early January that this year’s Winterlude would feature beach volleyball and sand castle demonstrations on account of the spring-like conditions, Mother Nature intervened and ensured the annual winter festival would go ahead as planned. In fact, I think this may be the best weather I’ve ever seen for Winterlude. It’s been consistenly cold and sunny – most years there’s a least one warm, rainy weekend that turns the canal and ice sculptures to mush. We’ve been out three times in the past week for various activities. 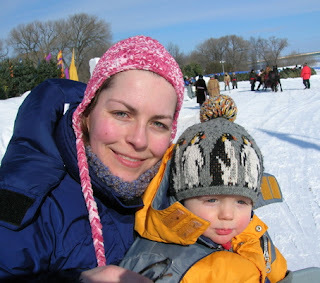 The boys have enjoyed seeing the ice and snow sculptures and the ice slides, not to mention the obligatory Beavertails. Here are a few pics of our adventures. K riding around in style. 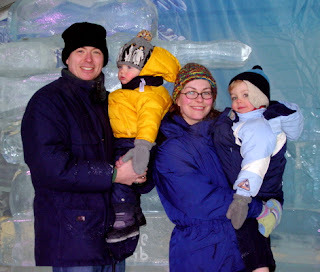 The happy (and cold) family in front of one of the ice sculptures. 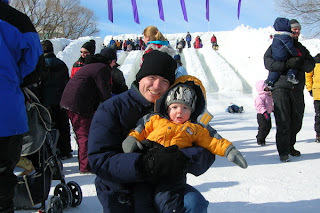 Daddy and K after a successful trip down the ice slide. B and K during our horse-drawn sleigh ride.